A survey by the National Association for Business Economics (NABE) released last month shows that more than three-quarters of business economists expect the U.S. to enter a recession by the end of 2021, according to a recent article in Bloomberg. 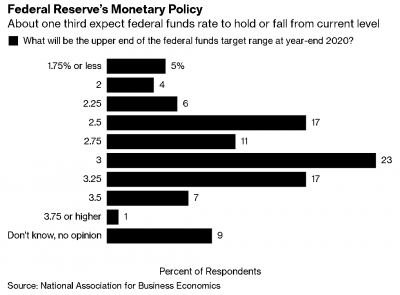 The article also notes that most survey participants believe the Fed will continue raising rates this year. For most of the participants, the article reports, the president’s trade policies remain a concern, with tariffs expected to boost inflation this year.